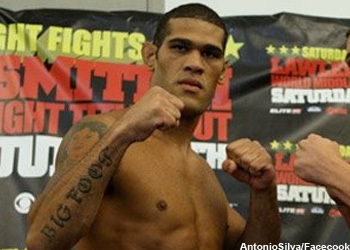 It appears you can add Antonio Silva to the ever expanding list of people that have grown tired of the politicking that has overtaken Strikeforce’s heavyweight division. “The president of Strikeforce should have the last word of it and dictate who fights who, and if you don’t like it you can lump it,” Silva told MMAWeekly.com. While the Brazilian’s intentions are good, it’s easier said than done when Fedor Emelianenko and M-1 Global are involved. Not only is Strikeforce trying to work out an extension before Emelianenko becomes a free agent after his next fight, but he also had his unprecedented 27-fight winning streak snapped in his last outing. So it’s understandable why M-1 has been extra cautious with who they allow their meal ticket to face next. It was rumored Silva was the front runner to land Fedor’s comeback fight, however months have passed and nothing has come of the chatter. Accepting that red tape will likely keep the world’s former/current top heavyweight occupied for another several weeks, Silva would be willing to change course and challenge reigning king Alistair Overeem for his crown. Unfortunately, it appears there’s some politicking going on there as well. On the flipside, Silva’s manager, Alex Davis, understands it’s a business and that all parties will always look out for their own interests. There isn’t much debate when it comes to fighting assignments inside the Octagon, so the chance for a rebuttal is a luxury Strikeforce fighters have been afforded – and needless to say, they have thoroughly exploited. “There’s a financial side, the guy has to pay his bills. I’ve been doing this over a decade and I know the characteristics of our sport is uncertainty,” Davis told the website. “It takes a little while to get the fights lined up, but at the same time I do think the Strikeforce situation has to be straightened out in the politics department.